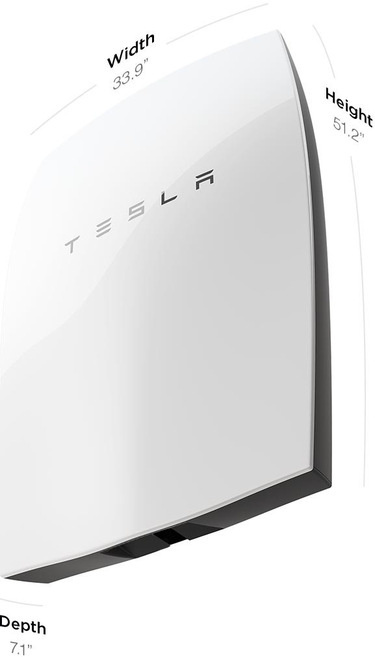 Tesla CEO Elon Musk announced two Powerwall lithium-ion batteries last year: one was a 7kWh (6.4kWh in actuality) version for $3,000; the other a 10kWh version for $3,500. (Prices do not include an AC-to-DC power inverter and system installation.) But the 10kWh version is no longer going to be sold. The 10-kilowatt-hour (kWh) Powerwall would have been optimized for backup and the 7kWh battery is meant for daily use. Both can be connected to rooftop solar panels or the grid to provide power, either during blackouts or periods of lower energy generation. Recently, Tesla quietly removed references to its 10kWh lithium-ion wall-mountable batteries from its website. In reply to a Computerworld inquiry, Tesla said it will now focus its attention on the more popular 7kWh battery for consumers. "We have seen enormous interest in the Daily Powerwall worldwide," Tesla's reply said. "The Daily Powerwall supports daily use applications like solar self-consumption plus backup power applications, and can offer backup simply by modifying the way it is installed in a home. Due to the interest, we have decided to focus entirely on building and deploying the 7kWh Daily Powerwall at this time." The Powerwall battery, which is 51.3-in x 34-in x 7.2-in, is scheduled for release this summer by Tesla Energy, a subsidiary of Tesla Motors. Tesla is constructing a massive Gigafactory for building the batteries just outside of Reno, Nev.
Up to nine batteries can be daisy-chaned together, providing up to 63 kWh capacity (with the 7kWh version). The batteries come with a 10-year warranty. Tesla Energy is also going to offer a commercial-grade battery called the Powerpack. That system will sell in 100kWh modules for $25,000 each. Musk said the Powerpack can scale infinitely, even powering small cities.